A Devon charity believes more lives will be saved with its newest purchase. The Devon Air Ambulance Trust (DAAT) has bought a EC135 helicopter outright, rather than leasing it. The £3.3m air ambulance was specially designed with the help of one of the trust's paramedics. DAAT raises £3m in donations every year to keep its two helicopters airborne. The charity was set up by Ann Thomas 16 years ago in memory of her son. "At no time could I let it be a failure, and the Devon people have taken it to their hearts," she told BBC News. The charity said having two air ambulances meant 50% of the county could be reached in about five minutes, with the remainder within 15 minutes. The new helicopter's design features include improved onboard storage facilities, an upgraded navigation system and a one-handed rear door system which will enable the safer removal of equipment while the helicopter's rotor blades are turning. 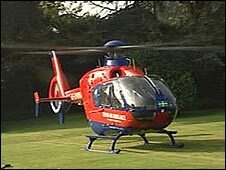 To date, the air ambulances have flown more than 13,000 missions.